I didn't even know that this was a Korean blood sausage chain. I thought I had walked into a fugu restaurant, judging by the gigantic blowfish sign outside. But when I walked in, the menu had nothing but pork. I assume that this blood sausage chain had since taken over the blowfish shop. 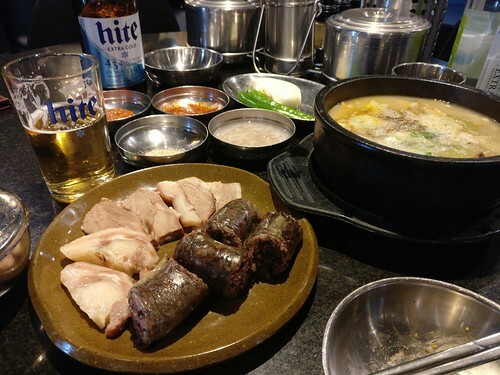 Either way, I went for the first item on the menu, which was this set of offal soup plus some cuts of sausage and pork. That soup turned pinkish after you stirred put the wad of gochujang at the bottom of it, going nicely down into my belly either way. The cuts of pork went progressively from lean to medium to super fatty, and one could complement that with some raw onions and chili peppers. Plus, there were an array of condiments to dip into. They're open 24 hours, so this makes for a nice post-drinking snack or even breakfast.